Dyro is letting clubbers into his inner sanctum for a Boxing Day celebration. 2014 has been his biggest year to date and he wants to thank his followers for their loyal support by offering two clubbers the chance to fly out to Las Vegas and join him for his Boxing Day show at ‘Light’ Las Vegas. The prize also includes a room for two in a Vegas hotel and dinner with Dyro ahead of the show. 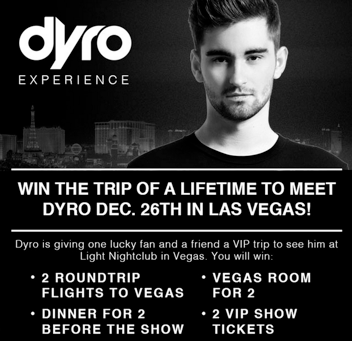 Fans of Dyro must follow his socials throughout 2015 and every few months they will have the chance to win the ‘Dyro Experience.’ Follow his Facebook, YouTube, Twitter and Instagram accounts for clues and hints for how to land the ‘Dyro Experience,’ coming later in 2015. Clubbers can also be members of ‘Team Dyro’ via his online portal. The portal is an online community for clubbers where they can keep updated by receiving exclusive news, tickets, merchandise, videos and the possibility to win prizes. Members will also be able to acquire points by connecting with their friends across their own social media platforms, sharing content and generating traffic to his site. Points obtained will be registered against your account and leading fans will climb to the top of the leader board, putting them in prime position to win the competition. For further information check: http://teamdyro.com.